UFC 215 became a welcoming party of sorts for Rafael Dos Anjos in the UFC welterweight division, as he joined the ranks of title contenders with his dominant victory over Neil Magny, adding himself to the list of men vying for the next shot at Tyron Woodley and the 170-pound title. And based on what’s likely next for the former lightweight champion, Dos Anjos also positioned himself to become one of the best Brazilians to ever compete in mixed martial arts. 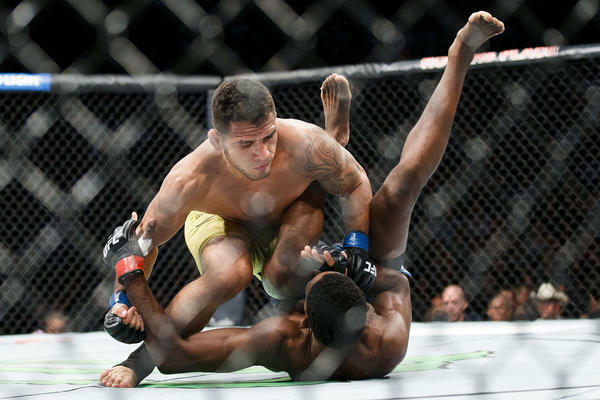 Dos Anjos established himself as a Top 5 contender in the division on Saturday night. He displayed complete control over the fight, never giving Magny an opportunity to get started, and his rear naked choke finish was his first submission victory since he submitted Kamal Shalorus more than five years ago. Dos Anjos has put together a compelling path through the UFC ranks that saw him go from fledgling lightweight to champion to contender in a new weight class where many doubted him. Throughout this run he’s defeated the likes of Donald Cerrone (twice), Benson Henderson, Anthony Pettis, and Nate Diaz. As a welterweight he’s taking a similar path in dispatching a former champion in Tarec Saffiedine at UFC Fight Night 111 and disposing of Magny at UFC 215. Now the question turns to what is next, and while there isn’t a clear cut number one contender for Woodley, the path towards a title shot for Dos Anjos isn’t very complex. The most interesting names ahead of Dos Anjos in the rankings include Demian Maia, Jorge Masvidal and Robbie Lawler. With Lawler coming off of a win over Donald Cerrone at UFC 214, he seems like the best name to pair with Dos Anjos at this time. However, Lawler has made it clear that he’s going to return on his own timetable, rather than jump right back into competition. Masvidal looked good against Maia back at UFC 211 and increased his stock even in the split decision defeat. Matching him against Dos Anjos wouldn’t upset anyone if that bout was made for one of the UFC’s a December events. With a win over either of these men, Dos Anjos would cement himself in the position where a title shot is imminent. His style of aggressive striking and his willingness to grapple could create an interesting dynamic that would help Woodley get out of his shell. Fans and experts alike complain about how Woodley uses evasive tactics to win fights, but Dos Anjos is the type of competitor that can thwart that. A Woodley vs. Dos Anjos title fight adds a new wrinkle to what has become a stale welterweight title picture. Rewind the clock back to 2008 when Rafael Dos Anjos debuted for the UFC, getting his head twisted via a violent Jeremy Stephens uppercut. Back then, no one would have believed he’d have an opportunity to become the first Brazilian to hold two titles in different weight classes. He may still be a long way off from that opportunity, but when you look at his near 10-year UFC run, it’s still an interesting thing to consider.